John Todd at Burger Yacht Sales tells me he signed up the 27.7m motor yacht Current Issue for sale at the end of last week. Built by Burger Boats in 1994 and refitted in in 2006, John says her current owner has kept her in immaculate condition. Accommodation is for six guests in three staterooms and twin 1080hp Detroit Diesel engines give* Current Issue* a range of 1,100 nautical miles at 12 knots. 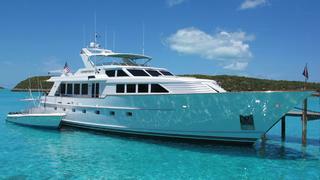 Lying in South Florida, her asking price is $3,295,000.